Ultimate Avengers: A world in crisis. Age-old enemies on the verge of attack. A mighty team is recruited, and Earth's ultimate hero is sought to lead them - Captain America. Unfortunately, he's been frozen in ice for over sixty years. Inspired by Marvel's best-selling books, "The Ultimates," this is the extraordinary story of six very independent heroes who, like it or not, must fight as one to save the world. Little did they know that ..
Marvel Studios presents the global phenomenon Marvel's Avengers: Age of Ultron. Good intentions wreak havoc when Tony Stark (Robert Downey Jr.) unwittingly creates Ultron (James Spader), a terrifying A.I. monster who vows to annihilate humanity. Now, Iron Man, Captain America (Chris Evans), Thor (Chris Hemsworth) and The Hulk (Mark Ruffalo) – alongside Black Widow (Scarlett Johansson), Hawkeye (Jeremy Renner) and Nick Fury (Samuel L. Ja..
Own Avengers - Infinity War Mug Gift Set from Deff, DVD, Blu-Ray & 4K Video Specialists - Free UK Delivery..
Marvel presents Marvel's Avengers Assemble, the Super Hero team-up of a lifetime. Iconic Marvel Super Heroes Iron Man, The Incredible Hulk, Thor and Captain America assemble for the first time ever in this new action-packed Marvel saga, starring Robert Downey Jr., Scarlett Johansson and Samuel L. Jackson, and directed by Joss Whedon. When an unexpected enemy emerges that threatens global safety and security, Nick Fury, Director of the i..
Own Avengers Infinity War - Infinite Power Within Doormat from Deff, DVD, Blu-Ray & 4K Video Specialists - Free UK Delivery..
Own Avengers Infinity War - Thanos Mug from Deff, DVD, Blu-Ray & 4K Video Specialists - Free UK Delivery..
Own Marvel Kawaii - Avengers Mug from Deff, DVD, Blu-Ray & 4K Video Specialists - Free UK Delivery..
A world in crisis. Age-old enemies on the verge of attack. A mighty team is recruited, and Earth's ultimate hero is sought to lead them - Captain America. Unfortunately, he's been frozen in ice for over sixty years. Inspired by Marvel's best-selling books, "The Ultimates," this is the extraordinary story of six very independent heroes who, like it or not, must fight as one to save the world. Little did they know that their biggest threa.. The darkest heart of Africa, unknown to most of the world... An isolated land, Wakanda, hidden behind closed borders, fiercely protected by its young king - the Black Panther. A king who holds the fate of the entire earth in his hands. Brutal alien invaders are coming, soon to fill every sky and control every land, seeking what is buried beneath ancient Wakanda. The mighty Black Panther is left with only one option that goes against the..
Marvel Studios unleashes the next global phenomenon in the Marvel Cinematic Universe: Marvel's Avengers: Age of Ultron. Good intentions wreak havoc when Tony Stark (Robert Downey Jr.) unwittingly creates Ultron (James Spader), a terrifying A.I. monster who vows to achieve "world peace" via mass extinction. 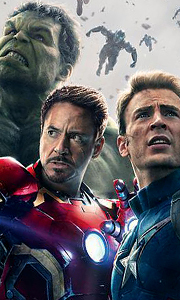 Now, Iron Man, Captain America (Chris Evans), Thor (Chris Hemsworth) and The Hulk (Mark Ruffalo) – alongside Black Widow (Scarlett J..
Own Avengers 1 to 3 Blu-Ray from Deff, DVD, Blu-Ray & 4K Video Specialists - Free UK Delivery..
Own Avengers 1 to 3 DVD from Deff, DVD, Blu-Ray & 4K Video Specialists - Free UK Delivery..
Own Avengers 3 Movie Collection 4K Ultra HD from Deff, DVD, Blu-Ray & 4K Video Specialists - Free UK Delivery..
Marvel Studios presents the global phenomenon Marvel’s Avengers: Age of Ultron. Good intentions wreak havoc when Tony Stark (Robert Downey Jr.) unwittingly creates Ultron (James Spader), a terrifying A.I. monster who vows to annihilate humanity. Now, Iron Man, Captain America (Chris Evans), Thor (Chris Hemsworth) and The Hulk (Mark Ruffalo)—alongside Black Widow (Scarlett Johansson), Hawkeye (Jeremy Renner) and Nick Fury (Samuel L. Jack..
"""Marvel presents Marvel's Avengers Assemble, the Super Hero team-up of a lifetime. Iconic Marvel Super Heroes Iron Man, The Incredible Hulk, Thor and Captain America assemble for the first time ever in this new action-packed Marvel saga, starring Robert Downey Jr., Scarlett Johansson and Samuel L. Jackson, and directed by Joss Whedon. When an unexpected enemy emerges that threatens global safety and security, Nick Fury, Director of th..
Own Avengers Infinity War - Characters And Emblems Mug from Deff, DVD, Blu-Ray & 4K Video Specialists - Free UK Delivery..
Own Avengers Infinity War - Connecting Icons Mug from Deff, DVD, Blu-Ray & 4K Video Specialists - Free UK Delivery..
Own Avengers Infinity War - Heroes United Mug from Deff, DVD, Blu-Ray & 4K Video Specialists - Free UK Delivery..
Own Avengers Infinity War - Icon Of Heroes Mug from Deff, DVD, Blu-Ray & 4K Video Specialists - Free UK Delivery..
Own Avengers Infinity War - Infinite Power Mug from Deff, DVD, Blu-Ray & 4K Video Specialists - Free UK Delivery..
Own Avengers Infinity War - Ready For Action Mug from Deff, DVD, Blu-Ray & 4K Video Specialists - Free UK Delivery..
Own Avengers Infinity War - Red Blue Assemble Mug from Deff, DVD, Blu-Ray & 4K Video Specialists - Free UK Delivery..
Own Avengers Infinity War - Space Montage Mug from Deff, DVD, Blu-Ray & 4K Video Specialists - Free UK Delivery..
Own Avengers Infinity War - Thanos Stencil Drip Mug from Deff, DVD, Blu-Ray & 4K Video Specialists - Free UK Delivery..
Own Avengers Infinity War - The Children Of Thanos Mug from Deff, DVD, Blu-Ray & 4K Video Specialists - Free UK Delivery..
An unprecedented cinematic journey ten years in the making and spanning the entire Marvel Cinematic Universe, Marvel Studios' Avengers: Infinity War brings to the screen the ultimate showdown of all time. The Avengers and their Super Hero allies must be willing to sacrifice all in an attempt to defeat the poweful Thanos. Special Features - Intro By Directors Joe And Anthony Russo - Featurettes: Strange Alchemy: Explores the new team-up..
Own The Next Avengers DVD from Deff, DVD, Blu-Ray & 4K Video Specialists - Free UK Delivery..